Featuring new upholstry designs, the Country Living room is the perfect snug for any Sylvanian cottage. 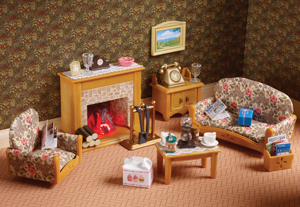 Includes matching sofa and armchair, coffee telephone and cupboard unit along with a real glowing fireplace. Set also includes fireplace accessories, magazine rack and more!